I have a dog named Haley. She’s an “English Cream” golden retriever. We also have Troy who is a regular golden retriever although huge at 100 pounds. So maybe not so regular. Troy and I are bonded at the hip, thank god. I paid a fortune for Haley as she is supposedly “ring trained and pure bred” both of which mean nothing to me. I was, at the time, frantic to try and replace a female dog named Rosie. Rosie was a Catahoula, a breed that is not recognized by AKC, maybe because it’s in their DNA to be very aggressive. It’s been YEARS and this is the first time I’ve had the strength to write about Rosie. I’m crying as I write. Rosie and I were soul mates. I know animals well and I know the really intelligent ones domestic or in captivity need what is called “enrichment”. It is creating things the animals can do to use their innate skills, intelligence, ingenuity and natural tendencies. Just like the Chimps and gorillas at the zoo, of whom I’m an amatuer expert and volunteer to speak about their intelligence, relationships, behaviors, etc., very smart domestic animals need it, too. Rosie was so darn smart, I knew she needed it. When I took her to agility training for the first time the trainer was astounded. “Oh, so you are very experienced working together in agility.” I said, “No, this is the first time we’ve ever done agility but we are soul mates and we get each other.” She couldn’t believe it. I had so many close calls with Rosie in aggressive situations. She would over power me even when I had her on leash. She just wanted to attack everything! (She adored me and was protective and completely loving toward me.) And she was capable of it and seemed to be looking for it. I was filled with anxiety constantly and knowing there was a legal liability if she ever did anyone harm. But also knowing I couldn’t keep her if she continued this aggression! It was torture. Finally, at a lunch I had at my house for some women friends, she attacked and bit a woman. I knew that was the end. The next morning, my husband and I cried together knowing that we had we had to put her down. Thank god we had the support of our friend Debbie Hartel who is an RN to help us through that. It was one of the most painful times in my entire life. I ADORED that dog and she adored me. I can’t wait to see her again at the rainbow bridge. Back to Haley. I never bonded with her. I think I resented her for not being Rosie. I have faked it for her sake. She is very loyal to me. Tonight, I looked in her innocent eyes and realized I need to just love her. So that’s what I’m going to do. There’s Rosie in front of gorgeous Ryder. Catholic? Really? How can you even do it? I attended the Catholic Church as a young child by obviously no choice of my own. I learned the prayers and the songs but never really knew what it all meant. It was totally confusing to me. I went to Catholic school as a very young girl (first and second grade if I remember correctly until my parents’ violent and frightening divorce.) I recall being slapped across the face by a nun for doing something with my mouth that she thought was gum. It wasn’t gum, it was just something weird I was doing with my mouth. I remember a nun saying my gorgeous and amazing drawing of a birthday party could have no way been drawn by me, put huge red exes through my art, told the entire class that I was a cheater and a fraud and to steer clear of me. I was asked to stand in front of the class, hold my hands out in front of me while she bashed them with a gigantic yardstick. Nice. I was a little girl in first grade. I never attempted to engage in art again. And my drawing was amazing for a first grader, BTW. I may have had a talent. I am outraged at the Catholic Church and have a hard time believing anyone can still support it. Pedophiles entered Catholic seminaries so that they had access to young alter boys to molest. This is now documented and it went on for years and years with high level people in the church turning a blind eye. It makes me want to throw up and makes me wonder how anyone can remain a Catholic. Just TODAY Cardinal George Pell, former archbishop of Sydney and Melbourne and CURRENT head of the Vatican’s Secretariat for the Economy is facing multiple charges of sexual assault on alter boys and other young men in the church. This is an outrage! Do We Really Do This? A chair and a whip in front of an innocent lion who was born in captivity and has never known anything else?? One time that animal was a sweet, innocent cub with eyes barely open looking for mommy. Now she’s being abused on a daily basis and has no choice in the matter and no one is speaking out for her. A social animal like a chimp in a cage alone only let out when he is required to perform? This is a chimp who is suffering every day of his life. He desperately needs other chimps to be with and without them his life is gut retching. I won’t even get into chimps in labs because I couldn’t finish this. THANK GOD BARNUM AND BAILY CIRCUS IS GONE FOREVER!!! F#@*& them!! They were animal abusers. Cirque De Solei is the replacement! No animals! Animals love their babies. They kiss them. I saw a mother chimp kiss her baby the other day. Here’s a baboon mommy kissing her baby. We as the human race are acting like idiots if we don’t take this more seriously. Elephants are being poached at a rate that will make them extinct in 20 years. And it’s for their tusks which are nothing more than our own teeth!! Somehow, somewhere, some human decided these tusk/teeth were worth something. They are worth nothing more than the 25 cents you get from the tooth fairy when your tooth falls out! Please, DO NOT buy ivory. You would be killing elephants. Great apes have a different challenge and of course it is human related. The Great Apes are the gorilla, the orangutan, the chimpanzee, the bonobo and the human being. Yes, we are one of the great apes. Except for us, every great ape is HIGHLY endangered because of US! Their territory is being encroached upon for a mineral called Coltan which is used in all our devices; our cell phones, tablets, cordless phones, computers, etc. PLEASE recycle your electronics. If you don’t know how, figure it out!! In Texas, Staples will do it for you, check it out in your own state. Coltan can be taken out of recycled electronics and used again. HUGE for the great apes! We are working hard to be sure the captive population of endangered animals is bio-diverse which means if and when these animals go extinct in the wild, at least our grandkids can see them in captivity. Bio-Diverse means we will not be mating sisters and brothers, etc. If things continue the way they are, in 20 to 30 years there will be no such thing as “wild animals”. How horrible is that? Please figure out a way you can help. Recycling your electronics is a tiny start but what else can you do? -Minimize your use of plastic in any way, plastic ends up in waterways and in the ocean and animals eat it. Little tiny sea turtles will eat anything and so many of them die from eating plastic. -If you can afford it, buy “sustainable” products like toilet paper and paper towels. There is a sustaianble logo on the products. -Recycle everything that you can. – Try hard not to use Styrofoam in any way. Its the absolute worst thing for the environment and wildlife. I’ve always been generous and sort of acted affluent, even when I had close to nothing!! So weird. My stepfather put a roof over our head and gave mom a menial amount of money to feed us and that was about it. I’m grateful to both of them. They were doing the best they could. But if I wanted hair conditioner, chapstick, skin lotion or anything other than the utter basics, I was on my own. I started babysitting at 12 so that I could buy myself those things. I had major experience and credentials because I had a baby brother and sister born 8 and 12 years after I was who I helped raise so I was a successful babysitter from the start. REALITY CHECK: In those days, I babysat for 50 cents an hour!! If a mother was gone for two hours, she would give me four quarters! And then I’d go buy my hair conditioner from Gemco! When my brother Sean was 12, I was 21 waitressing making pretty good money for a young girl and it occurred to me that no one had ever bought him a bike. I paid my rent, my bills, my college tuition and my books by myself but I thought every young boy needs a bike. And if his parents aren’t doing it for him, I will! I thought. In the morning, Sean’s father (my step father) was very excited about this and took a little credit for it. This was a long time ago and memory is a weird thing but I remember Russ giving me credit but also taking some himself which struck me as soooo strange. Sean never rode that bike once. He wasn’t a bike kid. I saw it rot on the side of the house. Maybe my Mom and stepdad knew something about Sean that I obviously didn’t. He wasn’t a bike guy! Even though he never rode it, the gesture made him happy and he never forgot it and that makes it all worthwhile. Anyone who works in any capacity with the apes had sunglasses on today and were carrying much needed tissue. Last night as I sat at dinner with my husband I kept hearing my phone tones for email and text. I don’t work (I volunteer) so I don’t get as much activity on my phone as most people and the rate at which these sounds were coming in alarmed me a little. “Excuse me please, let me check that,” I said to my husband. I am an amateur expert on the Western Lowland Gorilla and the Chimpanzee and I volunteer at the Dallas zoo two days a week speaking about behaviors and personalities of the apes. I have come to know each ape intimately and some know and recognize me. I love them deeply. Andrea, it’s Julie at the zoo. I know this is going to hit you hard and I’m so sorry. I sent you several emails and I think Tracy did, too. We lost Kona today, I read on text. I burst into tears. My husband was frantically asking what happened of course and I told him we lost Kona. “Oh, the one who got his toe bit off by Juba?” my husband asked anxiously. “NO!” I said, “those are the gorillas, Kona was the 7 year old Chimp!” I said as I sobbed. I cried myself to sleep. Driving to the zoo today was horrible. I was so scared to see the keepers but even more scared to see the Chimpanzee troupe. Cindy did a good job faking it at the Chimp Keeper Talk and then I saw Annie. We embraced and I started to cry and she hugged me even harder. Sweet thing, she’s only 28. I am good friends with Kona’s main keeper whose name is Will. Will is an emergency medical technician and is in Vietnam right now on a doctors without borders type mission with his father who is a surgeon. I was so shaken up that I texted Will and just said OMFG and he responded and was an absolute wreck. Annie is his girlfriend and he asked me to take care of her until he could get back. I told Will she’s a lot stronger than either of us, which is true. Annie is not unemotional, she just controls it well. When I told Annie Will texted me to take care of her she chuckled with tears in her eyes. Later in the day I saw many other ape keepers and it was emotional. Kona was one of a kind. He was a rebel, a clown, a strategizer, a risk taker and his two and a half year old little brother Mshindi loved him to pieces. In fact, at the zoo when an ape dies, they let the other apes in the troupe see the deceased body so they can process what has happened. Little Mshindi was slapping Kona’s dead body trying to wake him up. Gut wrenching. No one knows exactly what killed Kona. He had been a little lethargic and not eating well for a week. When they brought him in and put him under anesthesia to try and figure out what was wrong, he just died. Blood work and autopsy in progress but who cares, it won’t bring him back. This morning when the keepers got to work there was poop spread on every wall, floor and ceiling of the indoor Chimp bedrooms. Last night, the chimps protested. It was the only way they knew how. Today the Chimps were despondent and little Mshindi was trying to play the games on the ropes and climbing structures all by himself that he used to play 0n with Kona. Gut wrenching. I didn’t write this, looks like it’s from People Magazine but wow! After eight-year-old Gabriel Marshall underwent surgery to remove a tumor in his brain, the large scar left in its place “made him feel like a monster,” Gabriel’s dad, Josh, tells PEOPLE. “He said that he felt like everybody was staring at him and it made him feel like a monster, which broke my heart because to me he’s the most beautiful thing,” says Josh, 28. Josh wanted to make his son feel better about the procedure, especially once Gabriel’s tumor – an anaplastic astrocytoma that had metastasized to his spine – was showing no signs of regrowth. So Josh decided to get a tattoo to match Gabriel’s scar. 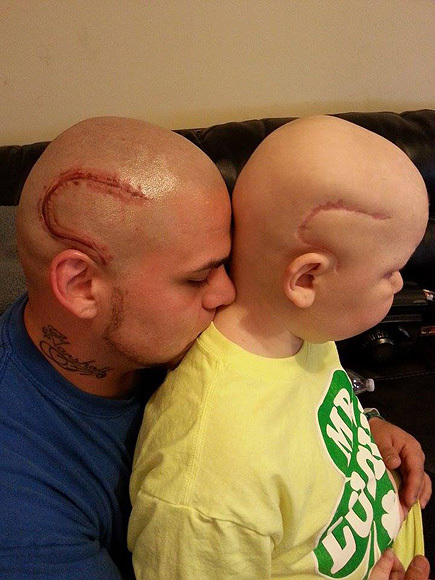 With his dad by his side, Gabriel learned to appreciate his scar. It’s been 15 months since Gabriel’s tumor was removed but doctors are monitoring him closely before officially saying he’s in remission. And on June 13, Josh, Gabriel and their matching scars made the news after Josh entered the annual Best Bald Dad contest, put on by St. Baldrick’s, a childhood cancer charity. “You have to be strong,” the woman in the waiting room at the oncology radiology facility said. “My husband has lymphoma everywhere in its final stages and we are cheerful and optimistic. It’s what you have to do to be with cancer.” Her husband will probably die. He is completely hunched over by what I suppose is osteoporosis in addition to the lymphoma his lovely wife told me has taken over his entire body. That first day we went for Steve’s radiation treatment, I noticed a bell on the counter with a ribbon tied to it. On the ribbon it said I made it the whole way! I was so new to this idea of my youngish husband having to go through radiation that I didn’t quite get what that was. Then, when Steve was in treatment, someone walked out, picked up the bell and rang it. Everyone in the waiting room applauded and some jumped up to hug the person who had just completed the grueling months long, daily treatment of radiation. I suddenly got it and of course, was one of the jump-up huggers. But I was also in tears. A couple weeks ago was Steve’s last radiation treatment for a mild recurrence of prostate cancer. MILD? Can you really even say that if its cancer? You really can’t. It’s cancer. In his case even though his numbers are low and very encouraging, you get only one shot at radiation. One. You can’t do it again because radiation causes cancer. What? We are trying to solve cancer with a cancer-causing agent? Yep. OMG. On Steve’s last day I was in the waiting room, waiting. My husband is a very subtle and humble person. He is not a person who has a need to bring attention to himself so I wasn’t expecting him to ring a little funny bell. I just assumed he would want to get out of there and put it all behind him while we wait and wait for results of radiation. He walked out, made eye contact with me, picked up that bell and rang it loudly with a huge smile on his face. I burst into quiet tears; I try not to be a spectacle either. People applauded, jumped up to hug him and it was a demonstration of how beautiful people can be when we realize we are all in the same damn boat. Cancer levels the playing field. I love animals and I know it sounds weird but I also care about bugs, worms and lizards. I simply can’t stand it when there is any kind of critter in my house who I know will die a slow painful death if they stay in my house. They will either die from starvation, lack of water or exhaustion from frantically trying to get out of the house as some insects do. Lizards are a little more low-key than that, but boy, are they fast when you try to capture them. (Little do they know, however, of my in-depth experience from when I was 12 or 13!) All these guys need to be outside to survive and I suppose they get in my house by either flying in when the door is open or riding in on our dogs. I cannot focus on anything else when one of them is in my house trying desperately to get out knowing it will be dead if I don’t do something about it. I know what you are thinking, How in the world does she even know these things are in her house?! How does she hear them or see them? The answer is my house is very quiet unless the dogs are going nuts about something and also very uncluttered so I probably see and hear things people with noisy, cluttered houses and closets don’t see and hear. I even save flies, I don’t think most people care about flies and I get that. Today as I was getting ready for Pickle Ball, I was in my closet and some movement on the hardwood floor caught my eye. I didn’t have my glasses on and I’m pretty much blind without them so I ran out to get them, put them on, entered the closet just in time to see the most adorable, tiny, baby lizard run for cover. This guy was beige colored with brown dots all over him. He had the cutest face I’ve ever seen all full of the brown dots. He was no more than 3 inches long. I ran for the pantry where I keep my sophisticated tool kit and set to work. I’ll tell you, I know lizards but this one was savvy. I was throwing my hung clothes out of the closet onto the floor, I moved my Elfa organizing shelves out of there and was trying desperately to get this little sweetie pie in my green cup and out to the back yard. No luck. The lizard was out smarting me. I was begging with him but to no avail. I was heartbroken. Finally, I had to leave for Pickle Ball and arrived half hour late. I forgot all about it. When I got home 3 hours later sweaty and happy from the sport I adore, I took my dogs out back and sat on a chair while they pooped and peed. I suddenly remembered the adorable little lizard and my heart sunk. Maybe he’ll be slower now because he is hungry and thirsty. God, if he’s still even in there and if I can even find him, no chance, I thought. I retrieved my tool kit and determinedly headed for the closet. The clothes were still on the floor and the Elfa shelving was still out. I knew the chances of finding this lizard were slim but OMG, there he was! Tucked into a corner and yes, a little slower than he had been earlier in the day. I chased him around a little and said a prayer and begged him quietly to let me save his life. The challenge with the sophisticated tool kit is that once you’ve got the critter trapped in it, for instance you’ve got a butterfly trapped against a wall with the cup, is that when you shimmy the manila folder against the wall to secure the capture that you don’t break a fragile wing or leg or whatever. Ya know? Anyway, this adorable lizard made what could have been in the wild his fatal mistake but in this situation saved his life. He was tired and hungry and thirsty so for whatever reason he thought his best bet was to climb up the wall in a corner. I am SO grateful to the Master’s organization that their green cups are so cheaply made that I was able to literately bend it to the degree that was like a corner! What’s that called you smart people? A 45 degree angle? A 90 degree angle? I used to know all this crap but I just don’t care anymore. I care about saving lives. Little guy fell into my cup and I covered it with the manila part of my sophisticated tool and brought it outside. I set the little guy free in my back yard on the dirt under the foliage where he so wants and needs to be. I saw his tiny head move from side to side. I can only imagine what his lizard joy must have been. “There are a lot of alpha personalities in the room!” he said. A normal gorilla troop in the wild consists of a silverback male, several females (called a Harem, sorry gals) and all of their offspring. The silverback calls the shots. He dictates when to feed, when to nest, when to move on, etc. He also breaks up bickering between his females and patrols his territory for his family’s safety. It’s a stressful job and silverbacks are notorious for heart disease. But he is, without a doubt, the boss. I know our DNA is 98.5 percent the same as gorillas. But we are human and I have noticed in racquet sports if women and men are playing together, certain men revert to gorilla behavior. I am an amateur expert on the Western Lowland Gorilla and the Chimpanzee and I work as a Gorilla and Chimp Ambassador at the Dallas zoo speaking to zoo guests about their behaviors and personalities. We are desperately trying to save these animals from extinction. I know each individual chimp and gorilla intimately and I love every one of them with my heart and soul. Eight months ago I switched from years of tennis to a game called pickle ball. It originally was for slightly older to very old people but young people are swooping in because it is so much fun (addicting actually) and such great exercise. It is very fast, can be played very aggressively and it’s a mix of women and men of all ages. The behavior that concerns me in pickle ball is certain men thinking they are in charge like a Silverback! They force unsolicited advice onto women, try to dominate how the rotation works, try to monopolize courts for themselves and other men, and sometimes even try cruel tactics to get the weaker women off the courts by slamming them with balls on an overhead smash, often 0n very old women. Let me be clear, most of the men do not fall into this category, many I would describe as officers and gentlemen, but something like 15% act like they can call the shots. Breaking News: I am an assertive person. Assertiveness is my nature and the school I attended of very hard knocks ( In addition to getting my degree in biz mgt at a U, so as to not sell myself short) has reinforced it. I try very hard to be self-aware enough to not let it slip over into obnoxiousness. But I am definitely not going to be a door-mat to anyone. I am also a very good pickle ball player. I have told many, many men in the last eight months that I do not want or need their coaching. I have had male partners tell me where to stand, when to come to the net, how to serve, etc. all of which I completely ignore. I withhold eye contact with those guys and freeze ‘em out. I pretend I’m playing alone. They can go to hell. The game will be over soon and I’ll have a different partner who is not so insecure or whatever the problem with this one is. When summer arrives our pickle ball venues become inundated with children at summer day camps and the availability of gym time is at a premium. Translation: there are not as many places and times to play so the ones where we can get very, very crowded. This is when we have to figure out systems for rotations for use of pickle ball courts. Recently three men and I were having a discussion about how that rotation should work. Seems everyone has a different opinion. I play at so many different venues (and most people don’t) so I’ve learned several different ways to do the rotation and I participated in the conversation wholeheartedly. The younger men are used to strong women in these kinds of situations, of course, but apparently the older ones are not. After that dialogue we came to an agreement on some rotation systems to experiment with. Half an hour later I was sitting on the bleachers next to a 78 year old man who had been part of the rotation discussion. “There are a lot of alpha personalities in the room,” he said. He leaned into me. “There are a lot of FEMALE alpha personalities in here,” he said. I’m positive my jaw dropped. I couldn’t believe what I’d just heard. To me this implied there are “people” and there are “women”. I was flabbergasted. I turned my head slowly and looked him in the eyes. “That is too damn bad,” I said quietly. He has treated me like a queen every time I’ve see him since that day. “Let them die.” the animal activist groups said about 17 elephants who were slowly starving to death in Swaziland, Africa because of drought and lack of food. “That is the natural thing to do,” they said. I am so glad the Dallas zoo and two other zoos here in the South (This isn’t the South! 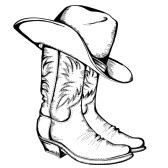 Texan’s would exclaim, this is Texas!!) did not agree and had what it took to cut through red tape (It’s illegal to take animals out of the wild and put them in captivity unless it is an extreme circumstance which this was) and bring these magnificent elephants to new homes where they could get the sustenance they need to survive and thrive. Our five Swaziland elephants are small because they have been malnourished their entire lives. Jenny, a Dallas zoo elephant resident for years weighs 10,000 pounds. In contrast, the only male elephant we got from Africa weighs a mere 3,600 pounds. His name is Tendaji and when he arrived at our zoo he stayed awake for 48 hours eating and drinking. Our four females from Swaziland are also seriously underweight. Now we are in the midst of the complicated process of “introducing” our new elephants to the ones we’ve had for years. In the animal world you don’t just throw a bunch of new animals together. With high intelligence and intricate social systems, it can take months to slowly let each elephant get to know one another and track how the personalities mesh or don’t. It’s a huge job for the elephant keepers.